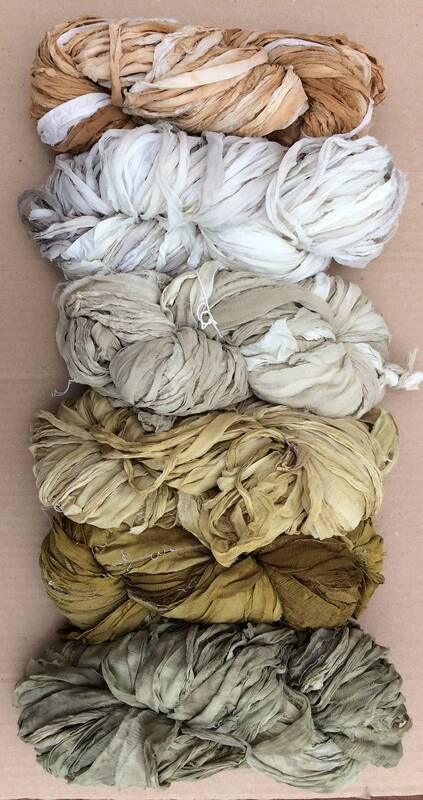 This listing is for Sari Silk Chiffon Ribbon, Eco dyed with organic products by Oliver Twists. (Still in the experimental stages at the moment). Colour: Please refer to the photograph for the colours available and make your selection in the drop down menu. Colours are listed from top to bottom in the photograph. The names refer to the plants that were used to dye them, not the eventual colour. Each Sari Silk Chiffon Ribbon Hank is a unique and inspirational art yarn and is 100% Silk. This Sari Silk Chiffon Ribbon is a bi-product of Silk Sari manufacturing in India and has a beautiful rich quality. They are handmade by womens' co-operatives in rural India from silk that would otherwise have been destroyed and sent to landfill.